Jordanian-based NUR Solar Systems increased sales of solar water heaters significantly last year. Their share in total turnover jumped from 40 % in 2017 to 80 %. Laith Zatar, Project Manager at NUR, pointed to growing demand from NGOs and the residential sector as the key reasons for the boost. The company also benefitted from a tender invitation issued by the Jordan Renewable Energy & Energy Efficiency Fund (JREEEF). Managed by the Ministry of Energy and Mineral Resources (MEMR), the fund invited companies to submit proposals for the construction of 3,000 solar water heaters in three geographical areas, and NUR has been awarded grants to put up 1,000 in the North Region. JREEEF’s aim is to have 200,000 SWHs installed in low-income homes in Jordan by the end of 2020. 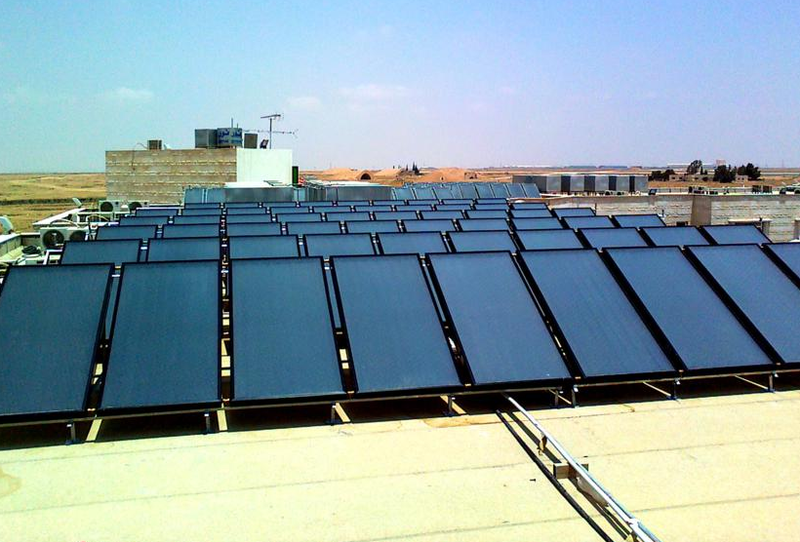 In the last 20 years, NUR has established a strong presence in Jordan’s solar thermal market, offering a wide variety of solutions to consumers and commercial clients. For example, the 600 m2 flat plate collector system shown in the photo provides 30,000 litres of hot water a day for the Royal Jordanian Air Force’s King Hussein Air College. Moreover, NUR sees a bright future for Solar Heat for Industrial Processes (SHIP) in the MENA region. Efforts to find a suitable global technology partner are ongoing. The business launched its first grid-connected PV system in 2012 and generated increasing sales from PV until 2017, at which time only 40 % of turnover came from solar thermal installations. According to the sales manager, NUR had been an early SHAMCI supporter, providing technical assistance to the implementing agency, the Regional Center for Renewable Energy and Energy Efficiency (RCREEE), which signed a cooperation agreement with the Jordan Standards and Metrology Organization (JSMO) on 16 September in Cairo to support the SHAMCI quality label. “As soon as they set up the SHAMCI network in Jordan, we will officially register as a member,” explained Zatar. In the first three months of 2018, NUR sent collectors to the Royal Scientific Society for testing. These tests have already been completed. The next step will be an application for a SHAMCI certificate. “The certification scheme has not been fully implemented in Jordan at this time, so applications are still pending,” said Zatar. He confirmed that the Jordanian government had yet to support product testing in the private sector.